Successfully Added LUNSY Set of 4 LED Under Cabinet Lighting Kit Max 9W EU Plug to your Shopping Cart. 【Bright】: The largest light intensity of the light flow is 460 lumens which can meet your most needs. 【Adjustable Brightness】Lamp brightness can be adjusted in 3 levels, warm white light, medium light and bright light, you can simply operate ON / OFF button to adjust the brightness. 【Easy Installation】: This lamp diameter is 2.28 inch and the width is 0.31in. It can be install in very narrow place. Comes with 4 fasteners tapes with sticky adhesive tape for faster installation without screws, which protects your furniture from damage. 【Widely Used】: 51.18in cable length of each lamp. 70.86in cable length of splitter box and 59.05in cable length of adapter for flexible installation. This lamp can be used widely indoors, such as bedside, cabinets, kitchen and any other places need lighting. 【Safety and Efficient】This under cabinet lighting is DC 12V, you can put it in an easy place to operate without worrying about electric shock problems. When you need white light, you may press the ON/OFF button for different brightness suitable for different occasions. The first ON press turns on the white light, the second and third short touch increases the brightness of the lamp. These lamps can be adjusted to the most bright 460 lumens to meet most of the needs. No matter you want a bedside light for reading or a kitchen light for cooking, this light can be a good choice. The 2.28 inch diameter and 0.27 inch thick make this light small enough to be placed in some corners. The 5.9ft electric cable allows the lights to be put in different places. 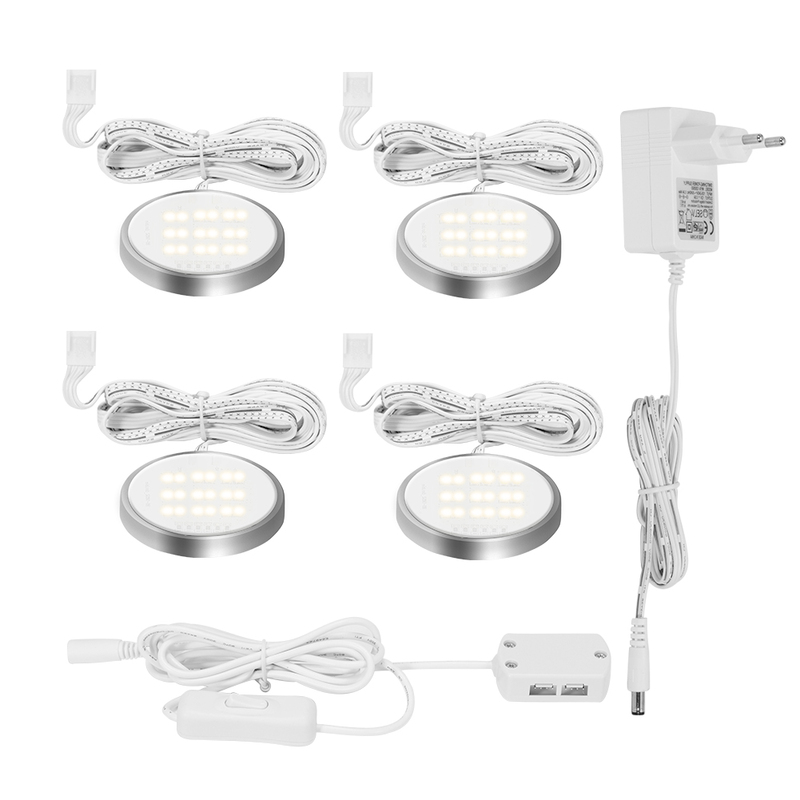 You only need to put the light in the selected location with a tape listed in the package and connect the plug,the the LED lighting can be used. No other complicated installation steps. If it's needed, you can move the light to other places with a new tape. This under cabinet lighting output voltage is DC 12V,this kind of low working voltage is touchable and safe to humanbeings, without any electric shock risk. You can adjust light brightness according to your need,the soft light can help you do things in a good mood.